1998 was a great year. The Goo Goo Dolls were dizzying up the girl, Shakespeare was in love, and, in a fateful move, Ben Covington signed Felicity Porter’s yearbook with a message so profound that it changed the direction of her life (and our hearts) forever. On a personal note, I also had a baby blue vinyl jacket that year that was almost identical to one Buffy Summers wore in the series pilot of Buffy the Vampire Slayer, so I was pretty much living the dream. 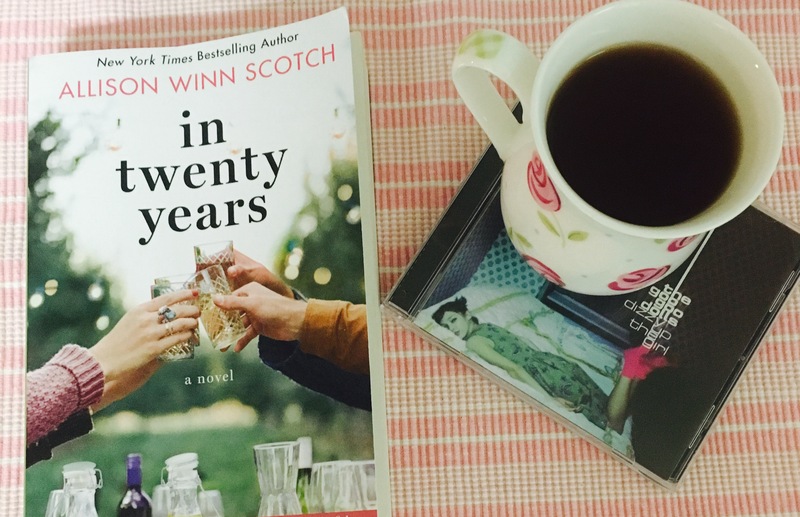 1998 was also an unforgettable year for six college friends in Allison Winn Scotch’s latest novel, In Twenty Years. On the eve of their graduation from Penn, the ringleader of the “six-pointed star”, Bea, encourages her friends to write down what they hope for themselves in 20 years. Armed with their unbreakable bonds and dreams for the future, the friends venture off into their post-graduation lives, never suspecting that their connection could one day be fractured, until heartbreak, distance, and Bea’s unexpected death drive them apart. Now, nearly twenty years later, the once inseparable soulmates find themselves near strangers—that is until they reluctantly reunite for one weekend in the house they once shared, on what would have been Bea’s fortieth birthday. Over the course of the weekend, buried secrets, artfully crafted facades and long-wounded feelings are broken down, spinning together a tale that captures the intricacies of friendship, the weight of hidden truths, and the hard realities of growing up and growing apart. The beautifully drawn, complicated characters are what make In Twenty Years a can’t-miss. There is nothing I love more than a book filled with people who are flawed and make mistakes, and every one of these friends completely stole my heart—from Lindy, the not-as-hardened-as-she-lets-on rocker, to Catherine and Owen, the once ideal, now struggling couple, to Instagram-obsessed, life-through-a-filter Annie, to ladies’ man with a heart of gold Colin (maybe my favorite character in the book). Allison Winn Scotch has a knack for building history and relationships that feel so real, you’d swear you graduated with this gang, that you were there for their wild nights, their fights, their inside jokes and their tears. I absolutely loved, sympathized with, and understood each character (even when they were making really bad choices), and found it so hard to pack up my plastic crates and move on from them after the final chapter. In Twenty Years is a wonderfully written, funny, nostalgic novel with an ending so pitch perfect, I found myself fresh out of Kleenex. It’s all the fun of a college reunion without any of the messiness, because no one needs to know that that girl who always burnt her popcorn if now a super rich CEO or that the guy everyone pined over is no longer a ringer for Leo DiCaprio. Sound like something that anyone with a class reunion coming up might be interested in! Great job Steph!